What's being billed as the largest single-phase speculative development ever built in the metro region broke ground last week in Gresham. Madison-Specht Vista Logistics LLC, a partnership between Portland's Specht Development Inc. and New York Life Real Estate Investors LLC, is constructing three industrial buildings at the Vista Logistics Park, a roughly 37-acre park at Southeast 223rd Avenue and Southeast Stark Street. New York Life Real Estate Investors is the capital partner in this project. The buildings will total 732,824 square feet. One building alone will top 494,000 square feet, a unique trait in the Portland-area market, according to Don Ossey, principal of Capacity Commercial Group. “Based on our research, Vista Logistics Park is the largest single phase speculative development ever constructed within the Portland metropolitan area,” he said in a release. 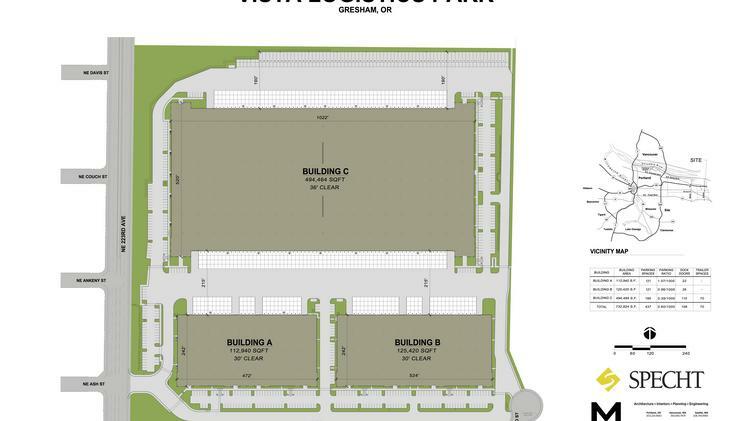 The two smaller buildings will be approximately 113,000 square feet and 124,400 square feet. Specht purchased the site from the Port of Portland for close to $9.3 million earlier this year. Ossey and David Ellis, also of Capacity Commercial Group, will lead the brokerage team leasing the project. Mackenzie is the project architect and engineer while Perlo Construction is the general contractor. The project should be completed in the fall of 2017. According to the release, Specht and its investment partners have begun construction on a total of 1,577,000 square feet of speculative industrial developments in the metro region since June 2014. In January, Specht and its partners bought the former headquarters of Hanna Anderson in the Pearl District and have embarked on a $25 million creative office remodel. Specht is also about to wrap up a 50,000-square-foot fulfillment center for Comcast in northeast Portland.